The “Emperor” of archtops in Chicago Blue Pearl! Epiphone presents the stunning new Ltd. Ed. Emperor Swingster Blue Royale, available for a limited time only at Select Epiphone Dealers. The Emperor Swingster is truly the “Emperor” of the renown Royale Series and features incredible Silver Sparkle binding on the neck, body, headstock, and archtop classic f-holes along with a spectacular Chicago Blue Pearl color finish. The new Epiphone Ltd. Ed. Blue Royale Collection spotlights six classic Epiphones, each given the Blue Royale treatment and featuring the same sterling Epiphone pickups, superb electronics, and rock solid hardware you’ve come to expect from Epiphone—the “House of Stathopoulo.” The new Ltd. Ed. Emperor Swingster Blue Royale will be one of the most beautiful and best sounding archtops you’ll ever own! Like all Epiphones, the Ltd. Ed. 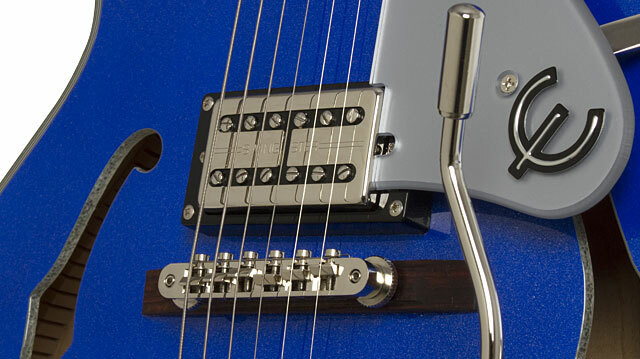 Emperor Swingster Blue Royale comes standard with a Limited Lifetime Warranty and Gibson 24/7/365 Customer Service. But don’t delay! The new Ltd. Ed. Emperor Swingster Blue Royale is available for a limited time and only at Select Epiphone Dealers. Visit your nearest Authorized Epiphone Dealer for details and give yourself the “Royale” treatment with the new Ltd. Ed. Emperor Swingster Blue Royale! The Ltd. Ed. Emperor Swingster Blue Royale features a hand-scalloped arched Select Spruce top with a laminated arched-back Maple body, a combination that produces the round beautiful tone that Epiphone archtops are known for. The glued-in Hard Maple neck has an easy-to-play SlimTaper™-D profile and a 24.75” scale length. The fingerboard has a 12” radius with 20 medium jumbo frets and features pearloid Emperor style “block” inlays. The headstock has the revered Epiphone “clipped ear” style profile with the same vintage “vine” inlay pattern seen on prized vintage Epiphone archtops from the 40s and 50s. The body, neck, and headstock feature Royale style Silver Sparkle multi-layer binding while the Epiphone-style f-holes have single layer binding. The rare and spectacular Chicago Blue Pearl finish is topped with a “Royale” Metallic Silver pickguard (with the iconic late 50s era “E” for Epiphone) to make the new Ltd. Ed. Emperor Swingster Blue Royale one of the most beautiful archtops Epiphone has ever produced. At the heart of the Swingster are Epiphone's new SwingBucker™ pickups, which feature a series/parallel electronics-switching package that outperforms all others in its class. Specially designed for the Emperor Swingster, SwingBuckers™ offer no-hum performance and feature classic Alnico-V magnets, enamel wire, and over-wound coils for the perfect combination of warmth and bite. Two push/pull Tone controls with Black “Top Hats” knobs with metal inserts allow you to change each SwingBucker’s output individually from parallel to series wiring, creating a wide palette of incredible sounds ranging from warm humbuckers to "quacky" single-coil type sounds and everything in-between. Of course, any swinging machine needs a vibrato and the Swingster is no exception featuring a Bigsby® B30 with original style "wire" handle, a favorite of archtop legends like Chet Atkins and Merle Travis. The Ltd. Ed. Emperor Swingster Blue Royale comes with Epiphone’s world famous rock solid hardware including a "Pinned" bridge with adjustable Tune-o-maticTM bridge for superb intonation and a rock n’ roll-classic Bigsby™ B30 Vibrato tailpiece with wire arm. Tuning is fast and reliable with legendary Grover RotomaticsTM machine heads with a pro-level 18:1 tuning ratio and the Blue Royale Swingster is tuned up at the factory with renown D'Addario® strings (10-46). A hard case is also available.